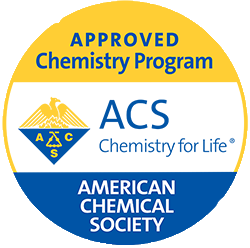 Our program is accredited by the American Chemical Society and all sub-disciplines of chemistry -- inorganic, organic, physical, analytical, biological and polymer -- are well represented by our diverse faculty. The department offers majors in chemistry, biochemistry, chemistry teaching, physical science teaching and environmental science. Our faculty members are active research scientists but our primary commitment is to provide a quality undergraduate education in chemistry. The WSU Chemistry Department aims to provide superb undergraduate educational experiences to our students. Small class sizes and ample experiential learning opportunities lead to a high level of interaction between the faculty and the students. Chemistry graduates from WSU have earned distinction in a diverse range of careers including industrial research chemists, government agency heads, and college professors. Many have gone on to chemistry PhD programs and professional schools such as pharmacy and medical colleges. For the past 3 years, over 90% of graduates in Chemistry or Biochemistry have been placed in careers or graduate schools, and all of our applicants to professional schools have been accepted during that period of time. We are located in Pasteur Hall and the Science Laboratory Center and we have excellent laboratory facilities dedicated to teaching and research. Our instrumentation includes excellent IR, NMR, UV-VIS, AA, and DCP emission spectrometers. We also have capabilities for x-ray powder diffraction, scanning electron microscopy, x-ray microanalysis, multi-angle light scattering and GC-MS. The WSU Chemistry Department is offering a variety of summer classes to help you catch up, keep up, and get ahead! See this flyer for details.